Okay, people always ask me about weather updates and what’s going on with data centers at any given moment. I recorded this summary last week as an overview of the various software infrastructure changes that have happened this year, and some meta-insights about data center watching. – results estimates for site: are just estimates, with some reminders of their limitations (I mention too-high site: estimates in middle of the video, in the context of the “5 billion page” spammer whose best domain actually had <50K pages on it). As a bonus, at the beginning of the video I review some some schwag from the recent SES San Jose conference. i need your help really, i am a confused seo, very sad for it. i cannot get the answer from others, i think you are kind, maybe would like help me. thanks in advance! my question is most of guys think backlinks=inbound links, i though so before, and i thought backlinks are not include internal links, but i see backlinks through google toolbar, found backlinks include internal links, i am confused, because glossory explain inbound links is “Links pointing to a website. When a user arrives at a website from another site, that link is called an Inbound Link. ” pls notice is “from another site” not “from another pages”, it is different, so i think inbound links arenot include internal links, inbound links not = backlinks, backlinks’s explain is “Backlinks are links pointing at a specific page. Most major search engines allow you to see who is linking to a page or site. That process is called “checking backlinks”. Some toolbars have shortcuts for this process. The syntax is often “link:http://example-url-here/”..
“. what do you think it? i am crasy for it now, need your help really! So what science fiction series was that you got given at the conference? The video was just a bit too pixelated to read the spine on the video. Well the weather is not pleasent for me, I have kept eagle eye on my website since last two months and found that all of my indexed pages are in supplement results. In mid July I checked mey website and found 19 supplement results, In the starting of august I found only one indexed page that was not supplement today after this post I checked and found 33 supplement result pages. I think know google gives lot of preference to the referential links. Links pointing to your webpage with some Keyword Oriented anchor text, this is similar to google bomb or google wash. I have one query here when you make a search vikas amrohi on google then you will find my site http://www.theseoguru.com comes on the top. I am not using vikas amrohi any where in the content of that page this due to link references(i think). My query starts from here when I make a sharp search “vikas amrohi” on google then again I found my website comes on the top. Why this page is coming on the top? As per google’s advanced search guideline this is sharp search and the search results should have both of the words. I am also scared all of my index pages are supplement, why these are supplement is the big issue can I relate Google wash to supplement results ?? Do you feel that the vast complaining currently going on by some webmasters regarding google serps to be justified? This is occuring on many webmaster forums and while my site doesnt seem to be affected it is also not advancing in the serps. I dont know how but my site gets the same amount of traffic from google for over 6 months – no change and I was wondering if traffic numbers are regulated to sites and if positions in the serps change according to googles alotted visitor numbers. OR is the official viewpoint one of Big Daddy being perfect? You sell yourself as “TheSEOGuru” and this is a puzzle? Considering there are about a whopping 680 results for your name and the fact that your name is adjacent to your url in every post/blog/forum./article site is it that difficult of a mental leap? contextual relevance… ? I have one question. The first sentence of your blog says “People always ask me…”. What is the best way to ask you questions? Is there any email contact or just posting the question here is the best way to go? If the second option is fine then I would like to ask you if there are any serious concerns about indexing AJAX web pages content at Google. And if so then what is the status and if there are any recommendations (e.g. : using specific AJAX framework). Also I would appreciate if you redirect me to some discussion forum related to this topic. it would have been helpful to know from a programming/Engineering/Development perspective of WHAT a DataPush is technically. Once again, the content is the king. Thanks Matt. When you say “correct to 3 significant digits”, is that site: estimates or all estimates? These books are a must read for every SF Fan. The german translation consists of 6 books and approximately 5500 pages. Did I miss the memo somewhere, or is there a podcast feed that I can subscribe to for Matt’s show? I’ve really enjoyed watching your videos on Google Video. My team and I find them really useful and informative. To what extent does a servers location impact natural search for a site? I look after a site with presence in 9 different countries (Australia, Poland, South Africa, UK etc) and all of our servers/data centers are located in London. Would Google view our Australian domain in a differnt way (perhaps view it as more important) if our servers were actually in Australia for gumtree.com.au? SEW, a “data push” is basically what it says. the moving of either a database, or files, or whatever… from a development server to a live production server. It’s an update of data. maybe you weren’t asking about “what it means” moreso as “what does it mean in Google’s context”… I wish I could help with that part, but I can’t. Good idea to wear the dark T-shirt again, Matt. When you wear a light one, your shoulder kinda blends into the back wall (although it looks pretty cool in that Criss Angel, Mindfreak sort of way). 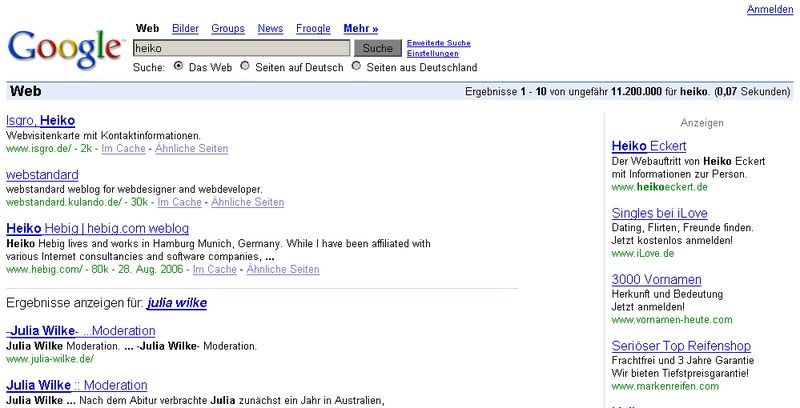 I don’t get the interrelationship of “heiko” and “julia”, maybe you can? Awesome info, as always. Thanks much, Matt! I can recomend the nights dawn trilogy – his latest ones good to i stayed up all night to finish -it. Mary Gentles Ash for example got split. anyway… it just seems like their isn’t much point to doing a video. sure you can get through more topic, but your lips aren’t in sync, and you don’t show any visuals or anything. some screencaps, or something would help. Except for the props, I’ve just minimized my browser and kept workign while listening to your videos. Do you think each part has equal value? And is each part worth $99,999.99 in the California market place? Has it been done on eBay already? And finally…would one part show up in Google…one part in Yahoo and another in MSN? So what’s the purpose of the living room? echolu, “backlinks” refers to all links pointing to your page. A lot of people say “off-domain backlinks” to exclude self-links from your own domain. you’ll see not a ton of links (I know my links are probably nofollow links, and several more of the SEO links are probably that way too). So I think your site is fine (e.g. I wouldn’t worry about spam penalties), it just a matter of we have to select a smaller number of documents for the web index. If more people were linking to your site, for example, I’d expect more of your pages to be in the main web index. martialarm, any update that affects a significant number of sites can’t be 100% perfect, but we do a lot of testing to try to ensure that updates improve quality and relevance from what we had before. Part of what we do online is listening to get reports of anything suboptimal so that we can try to fix it in future changes. Ian, I believe that’s all results estimates. If I search for [matt cutts] I get “Results 1 – 10 of about 1,970,000 for matt cutts”. In that case, 1.97 are the three significant digits. We’ve done it that way for years and years, but fewer people notice than you’d expect. Philipp, great transcript. I added a couple comments to clarify a few words on your post. That is probably the most refreshing thing I’ve read in a long while. Thank you. John. Huh. I can see it just fine, Jonathan, so I’m assuming that it was just a transient thing..
could you be more pricise concerning the peoble gettin cought by the black tuesday? with your little hints you were saying: “do not always use the same keyword in title, desc, h1, h2 and incoming anchor text and don’t stuff the keywords in the s on your site because this will make it look like one of those millions of spam sites, which we only can kill by targeting all sites which fill this scheme, right? That’s what you mean with “deoptimizing” and “not listening to SEOs too much”, or did i miss your point? Our site hasn’t changed very much over the last four years so the only time I hit the SEO forums is when we get penalized by Google. When Google kicks you between the legs and is silent when you ask why, who else are you going to ask? Honestly, it would be much better if Google simply said (via sitemaps or something), “hey, your keyword density is a little high, tone it down a bit.” We’re not hiding text on a page, paying for links, using whacky redirects, etc. We’ve been running this site for 11 years now and have always enjoyed well indexed SERP’s. However, twice now we’ve been kicked between the legs and the last time we asked why and the Google team repeatedly told me nothing was wrong and that we weren’t penalized. This time your video is the only thing which has stated that their was indeed a penalty pushed out on August 17th. I’ve lowered our keyword density but frankly, I have no clue what else could be the problem so I’m sitting here bent over what’s left of my groin and scratching my head at the same time. Not a pretty picture to be sure! Good stuff Matt, thanks for the update. I had a good friend that was a professional photographer and he taught me a lot about taking pictures – so maybe I’m overly critical. But did you ever see a picture of a person with a background object sticking out of his/her head? It’s distracting (especially to me). You’ve got to make sure that background map (with the dark frame) is not lined up with your head (and you dark hair). Look at the videos and you’ll see what I mean. And let’s see some color beside earthtones! You must have something in Google red, blue or green. thanks for the reply to my question Matt. Can you also mention what you can about my question to whether search engines monitor and so alter the rankings of a site within the serps. I find it amazing I get approx the same number of google visitors per day. So I ask if google determines my site should get 500 uniques out of the daily averages searches in my field and alters serps positions to achieve near this? i love Matt! thanks for your answer! show 36,600 to 51,400 results instead of just a few hundred that google.com shows? The big difference is what the Threadwatch article was about. Hi Nintendo, I answered your question on the Threadwatch thread before it got deleted. The short answer is that the lower numbers are likely to be the correct ones. I appreciate your comment about Supplementals and I can understand the implications if a website fell into the following category (total pages = 100, main index 50, supplemental 50). But I’m still seeing the following (total pages = 100, main index 100, supplemental 50) – meaning there are 50 entries out there in supplemental that in reality are duplicates of entries in the main index. These are malformed URL’s (multiple slashes, tracking code, etc). We have used redirects to point these to the correct representation. I’ve written to Google about this a number of times and was hoping Google would provide some means to remove these duplicate entries, especially since these entries are at least a year old. Redirects have been put in place nearly a year ago with no effect (on Google index) since the cached entries are so old. I believe there is a real problem with this. We recently were notified by Google that one of our sites was linking to a “bad neighborhood” site and had thus been deemed low in the Trust category. We were even provided the exact external link which was very helpful. Upon investigation however, we found that this link had been removed from our site over a year ago during a major cleanup. The only page that Google could have found this link was on one of these old Supplemental cached pages. Our page where this link had been removed is currently in the Google main index with a recent cache date. I understand the intent of the Supplemental index, but perhaps there are unintended consequences such as this that might have negative effects on websites. So…by using two rooms…each room ends up fresh on alternating weeks. TxRex, your ideas are fascinating to me, and I wish to subscribe to your newsletter. Matt, before you referred to June 27, July 27, Aug 17, etc as “data refreshes” and now you are calling them “data pushes”. Are these two terms interchangeable, or are they different things? Here’s a question for you, Matt, if you are still reading new posts in this thread. … it just a matter of we have to select a smaller number of documents for the web index. If more people were linking to your site, for example, I’d expect more of your pages to be in the main web index. Because the Web is growing so fast, largely because of the number of useless sites being put up for various reasons, Google has decided not to try and keep pace with it any more, by adding new capacity all the time. So you’ve made a fundamental change in your indexing, and instead of indexing as much as you can, you are now indexing as much of each site as each site merits (that linkage evaluation). Is there any reality in that theory, or is it way off the mark? Totally off-topic (but Google-related) question and then a totally off-topic (but also Google-related) comment. Is this related to the Adwords (advertisers) and the quality of the sites they are advertising or to the Adsense (publishers) and the quality of the sites they are publishing? (I suspect the former). Also, any other information you or any other Google-type reading this would be greatly appreciated. Was it because I was critical to the way Google managed the 27th June issue? Or was it because I compared Google to the IBM of the 70’s? to estimate how many total pages indexed by Google, I simply search keyword w/ some most common keyword like letter ‘a’, assuming almost 99% of pages contains such keyword ‘a’. so I got about 20Billion total pages from Google, 11B from Yahoo, and 2.5B from MSN. Interesting enough, I tried this over last couple months, at different dates so to sample the changes of total pages got indexed. And it did show quite some difference, although no question that Google has been the No.1 on the total number of indexed pages, way ahead of the No2&3. However, the actual value change from 18B to 25B for Google over last couple months. 1) why is 25B pages the limit? due to storage or computation(crawling/indexing) time constraint? Internet’s total pages is growing rapidly, why I don’t see the similar proportional growth in the total number of indexed pages? how long does it take for the index to be updated after the completion of a crawling cycle (I presume indexing run simutaneously(or should I said right behind) crawling), how would any searchEngine keep up w/ the growing web pages ? is the indexing too slow to set the above 25B limit? or the crawler? why not the rest of the web pages, get incrementally crawled & indexed within 1 day or shorter? what’s the constraint preventing this? I cann’t wait to see Google provide search over the real-time web! How long are we gotna wait for this to happen? I have exausted all means of help so hoping you can look into this. I manage a website that I redesigned last April. It had duplicate description tags and product descriptions which I fixed. It has a hyphen in the domain and was one of those that lost most of it’s pages in May but slowly regained them all. It was a year old then and never had ranked for it’s main keywords and still isn’t except for the words in it’s domain. This site is squeeky clean but it appears to be penalized for some reason that we can’t fathom. The host said this was a new IP address when we changed hosts in early July so we don’t believe it’s a poisoned domain. I sent in a reinclusion request 2 months ago and still no word from Google so I’m wondering if you can check on it. Not sure I should post the url so if you can email me I’ll send you the info. Just saw this video but I liked video on crawl dates. On a side question: Now that google has purchased YouTube are ther any plans to integrate google video and youtube? I know this post is old but the video is offline – something along the lines of ‘this video is no longer available’. i was hoping to watch it again. Google did a great job with their cameo in the movie Crank (badass over-the-top action movie where all sorts of stuff blows up and people die, if you’re into that sort of thing). I saw it last night. You guys really lost yourselves in the moment. I just wanted to pass my compliments for the useful array of SEO videos you have uploaded to Google Video. The Data Center Video was well worth the watch….I totally agree the focus should be on specific and unique content. also never thought of testing sites with a text reader in terms of usability. I guess my list of priorities have been re-structured in-line with your video comments…. As do I! One of the better posts I’ve been digging up over the past days.